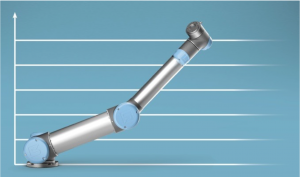 If you’re looking to automate with robots, it’s important to build a solid business case if you want to know the true value of robot automation. Many businesses calculate ROI by using the payback period, which is taking the cost of the robot and then dividing it by the monthly salary of the worker. It’s important to note if you calculate your ROI this way you won’t be able to calculate the total value and impact that robot automation will have on your business. To make a more accurate calculation the first step is to start with the initial cost and to also consider the short-term and long-term tangible and intangible benefits that you’ll receive from investing in this type of automation. When building your business case be sure to include these elements into your calculation so you can decide on the right robot for your business. If you automate using a collaborative robot, what would the total robot investment be compared to the deployment of a traditional industrial robot? To calculate your total robot investment you must include the initial investment and take into consideration fees for additional system accessories and integration charges that you may incur. 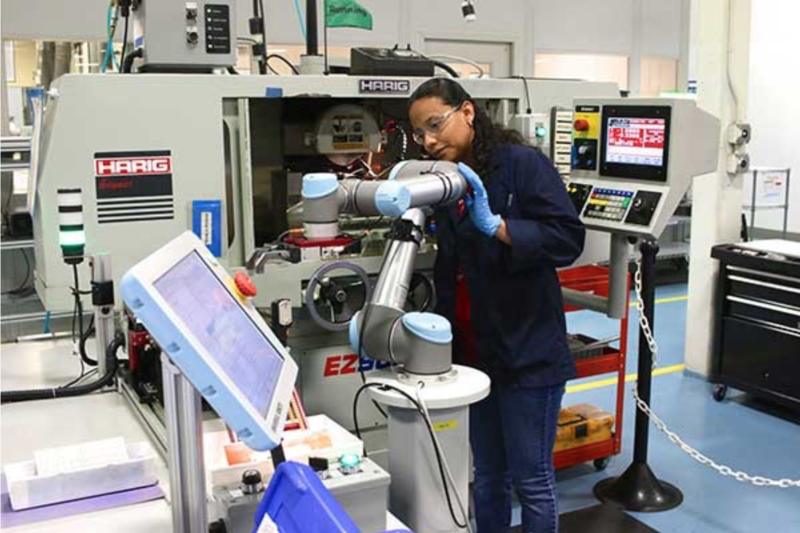 Consider future maintenance costs and whether or not a particular robot can be easily redeployed within your business to meet the changing needs of your production. Look at whether you need to change the layout of your factory floor if you’re looking to deploy traditional industrial robots, as this can be a big business expense. Also factor in costs related to upgrading or updating the technology and take into account feature add-ons. What would the deployment of collaborative robots mean for the health, wellbeing and safety of your employees? If you automate a particular process in your production how much would you save in social costs and health, medical and insurance related expenses due to an introduction of safer, more ergonomic work practices? Automation will keep employees safe particularly if you adopt collaborative robots, which are ergonomic and have the ability to work along side humans safely and effectively. Occupational health and safety issues (OH&S) in relation to manual handling processes are all too common, particularly musculoskeletal disorders (MSDs). With the integration of collaborative robots, these problems can be significantly reduced because workers can be freed up to work on less laborious and repetitive tasks and moved onto higher value roles within a business. It also gives workers the opportunity to learn about robot technology and to acquire new skills that will support their future growth and the growth of your business. 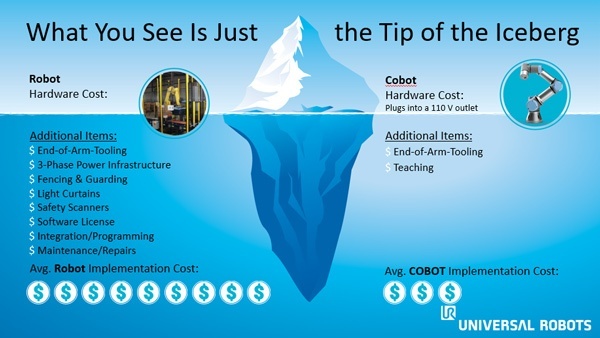 How much would you save in recruitment and training costs if you automated with a collaborative robot? Collaborative robot technology can be set up easily, programmed, reprogrammed and integrated into a business by virtually anyone, which means you don’t have to employ specially trained engineers or technicians to integrate and maintain the robot. Automation using collaborative robots is easy, it will save you time and it means your production won’t be offline too long during set up. This means you will also save money and time on recruitment and training processes. What would these productivity gains mean for your business? Take a look at the number of repetitive and manual processes you have running now in your business. How many hours, weeks or days do these tasks run? How many employees complete the task? To ensure the continued health and safety of your workers imagine the employee and business benefits gained simply by automating these processes with robots? Doing this will give your employees peace of mind when it comes to their health, wellbeing and safety and also allow them to spend more time working on other more interesting tasks or projects within the business. If a robot could work on these repetitive tasks for you 24 hours a day, consider the shortened turn-around time for your products to go from your factory to your customer’s door. If you run a more efficient production consider the additional work you could take on in your business. This may mean employing more workers to meet an increase in customer demand. If you automate with robots what would you save in raw materials? How much would your product output increase by? What would an increase in customer loyalty and retention mean for your business? If you have a production line, which is unstable and has a poor quality product output, raw materials are wasted and product rejection rates are high. As a result customer loyalty and retention will inevitably decrease because your customers will demand high quality, consistent products every-time they order with you. With collaborative robots, the technology ensures consistency and a high-quality product output, which will significantly reduce the amount raw materials wasted. It will also grow your business because workers will be able to achieve more. 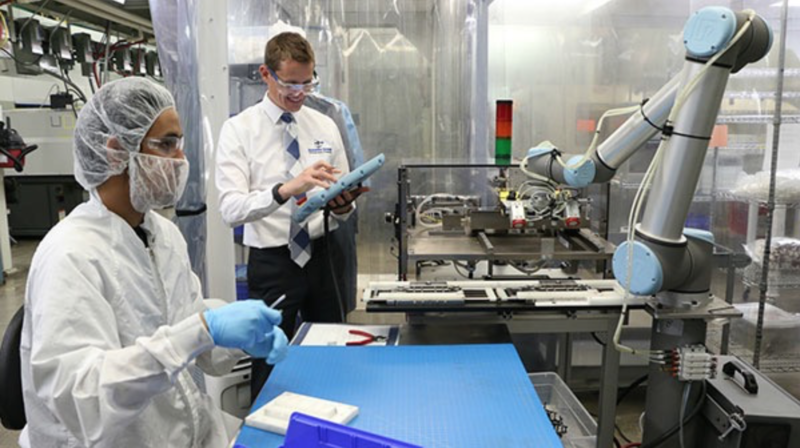 If you have an unstable production line, write down the pros and cons of keeping an employee working on these tasks versus automating with a collaborative robot. It’s worth spending the time taking into account all these factors so you can get a real understanding of the short-term and long-term value robot automation will bring your business. It’s a detailed process because this is an investment in the growth, development, sustainability and competitiveness of your business. To learn more contact your local Universal Robots partner. When you’re building your business case, use the term ROI to justify your robot investment rather than the term payback period, which is the number of days, months or years it will take for you to recover the cost of your investment. Your payback period will always be longer than your ROI as your payback calculation is used to offset wages for examples whereas ROI calculation takes into considerations overall tangible and intangible business benefits and impact both short and long term.